Research Unit for Political Economy is based in Mumbai, India. The group publishes the journal Aspects of India’s Economy and a range of research publications in English and Hindi. Shaken by the revolt, the British felt it wise to put up a facade. (In the words of Curzon, the foreign secretary, Britain wanted in the Arab territories an “Arab facade ruled and administered under British guidance and controlled by a native Mohammedan and, as far as possible, by an Arab staff….There should be no actual incorporation of the conquered territory in the dominions of the conqueror, but the absorption may be veiled by such constitutional fictions as a protectorate, a sphere of influence, a buffer state and so on.”) The British High Commissioner proclaimed Emir Faisal I, belonging to the Hashemite family of Mecca, which had been expelled from the French mandate Syria, as the King of Iraq. The puppet Faisal promptly signed a treaty of alliance with Britain that largely reproduced the terms of the mandate. This roused such strong nationalist protests that the cabinet was forced to resign, and the British High Commissioner assumed dictatorial powers for several years. Nationalist leaders were deported from the country on a wide scale. (In this period the whole region was in ferment, with anti-imperialist struggles emerging in Palestine and Syria as well.) The British also drafted a constitution for Iraq that gave the King quasi-dictatorial powers over the Parliament. As part of the Anfal campaign against the Kurds (February to September 1988), the Iraqi regime used chemical weapons extensively against its own civilian population. Between 50,000 and 186,000 Kurds were killed in these attacks, over 1,200 Kurdish villages were destroyed, and 300,000 Kurds were displaced….The Anfal campaign was carried out with the acquiescence of the West. Rather than condemn the massacres of Kurds, the United States escalated its support for Iraq. It joined in Iraq’s attacks on Iranian facilities, blowing up two Iranian oil rigs and destroying an Iranian frigate a month after the Halabja attack. Within two months, senior U.S. officials were encouraging corporate coordination through an Iraqi state-sponsored forum. The United States administration opposed, and eventually blocked, a U.S. Senate bill that cut off loans to Iraq. The United States approved exports to Iraq of items with dual civilian and military use at double the rate in the aftermath of Halabja as it did before 1988. Iraqi written guarantees about civilian use were accepted by the United States commerce department, which did not request licenses and reviews (as it did for many other countries). The Bush administration approved $695,000 worth of advanced data transmission devices the day before Iraq invaded Kuwait (Alan Simpson, MP & Dr. Glen Rangwala, “The Dishonest Case for War on Iraq,” Labour Against the War Counter-Dossier, September 2002). The decision to establish relations with the U.S. [was] taken in 1980 during the two months prior to the war between us and Iran. When the war started, and to avoid misinterpretation, we postponed the establishment of relations hoping that the war would end soon. But because the war lasted for a long time, and to emphasize the fact that we are a nonaligned country [i.e., not part of the Soviet bloc], it was important to reestablish relations with the United States. And we choose to do this in 1984….When relations were reestablished we hoped for a better understanding and for better cooperation….We dealt with each other during the war and we had dealings on various levels…. Iraq came out of the war burdened with $40 billion debts, excluding the aid given by Arab states, some of whom consider that too to be a debt, although they knew—and you knew too—that without Iraq they would not have had these sums and the future of the region would have been entirely different. We began to face the policy of the drop in the price of oil….The price at one stage had dropped to $12 a barrel and a reduction in the modest Iraqi budget of $6 billion to $7 billion is a disaster…. We had hoped that soon the American authorities would make the correct decision regarding their relations with Iraq….But when planned and deliberate policy forces the price of oil down without good commercial reasons, then that means another war against Iraq. Because military war kills people by bleeding them, and economic war kills their humanity by depriving them of their chance to have a good standard of living….Kuwait and the U.A.E. were at the front of this policy aimed at lowering Iraq’s position and depriving its people of higher economic standards. And you know that our relations with the Emirates and Kuwait had been good…. It is not reasonable to ask our people to bleed rivers of blood for eight years then to tell them, “Now you have to accept aggression from Kuwait, the U.A.E., or from the U.S. or from Israel.”…We do not place America among the enemies. We place it where we want our friends to be and we try to be friends. But repeated American statements last year make it apparent that America did not regard us as friends (New York Times International, September 23, 1990). Sanctions impinge on the lives of all Iraqis every moment of the day. In Basra, Iraq’s second city, power flickers on and off, unpredictable in the hours it is available….Smoke from jerry-rigged generators and vehicles hangs over the town in a thick cloud. The tap-water causes diarrhea, but few can afford the bottled sort. Because the sewers have broken down, pools of stinking muck have leached through the surface all over town. That effluent, combined with pollution upstream, has killed most of the fish in the Shatt al-Arab river and has left the remainder unsafe to eat. The government can no longer spray for sand flies or mosquitoes, so insects have proliferated, along with the diseases they carry. 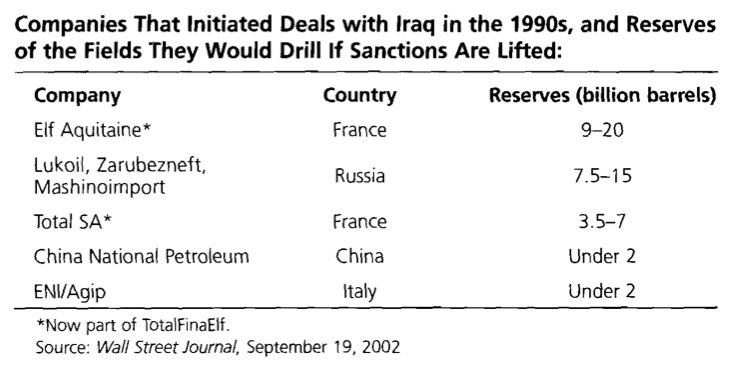 Another report prepared in April 2001 for Cheney by an institute run by James Baker (U.S. secretary of state under George Bush Sr.) ran along similar lines: “Iraq remains a destabilizing influence…in the flow of oil to international markets from the Middle East. Saddam Hussein has also demonstrated a willingness to use the oil weapon and to use his own export program to manipulate oil markets.” The report complains that Iraq “turns its taps on and off when it has felt such action was in its strategic interest to do so,” adding that there is a “possibility that Saddam Hussein may remove Iraqi oil from the market for an extended period of time” in order to damage prices. The report recommends that “therefore the United States should conduct an immediate policy review toward Iraq including military, energy, economic, and political/diplomatic assessments.” The report was an important input for the national energy plan—the “Cheney Report”—formulated by the American vice president and released by the White House in early May 2001. The Cheney Report calls for a major increase in U.S. engagement in regions such as the Persian Gulf in order to secure future petroleum supplies. as formed: 50 percent British, 25 percent German, and 25 percent Royal Dutch-Shell (Dutch- and British-owned). Dispatches from Durban , Bill Fletcher Jr.